Everyone feels small or inadequate at some point in their lives. The Tiniest Tumbleweed is a story written to help children learn more about what they can do to become their best selves, despite whatever may be making them feel small or limited. The characters are two Sonoran Desert neighbors, a tiny tumbleweed and a baby house sparrow, who are both small for their age. Guided by the loving encouragement of their parents, they learn to work within their physical limitations to grow to be the best they can be, rather than measure themselves against others. As a result, they also learn how they can help one another, providing a lesson about the synergy between living things and the boundless opportunities those relationships provide. The proven psychological concepts for building self-efficacy combined with a children's literature writing method that helps young readers believe in limitless opportunities are what make The Tiniest Tumbleweed unique. 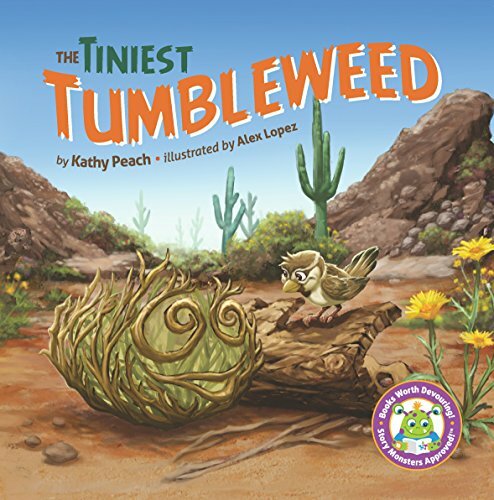 The connection between the characters in the book, a tiny tumbleweed and a sparrow, provides a fascinating look into the real-life desert relationship between tumbleweeds and birds. Following the story, a well-researched curriculum guide captivates young readers, helping them develop a deeper respect for nature. Story Monsters Approved! Kid-tested, judge-certified!